For over 16 years HUB has been offering custom combustion solutions designed for the varied needs of glass workers. From simple single-burner Venturi systems to multiple forced-air burners with computerized temperature control, HUB will get you through the often complicated process of setting up and learning to operate your equipment safely and efficiently. HUB stocks and distributes the highest quality parts—Ametek, Antunes, Asco, Dungs, Eclipse, Honeywell, Partlow, Protection Control, Pyronics, Spencer, Turbine and many others. Standing behind every system purchased from HUB is the service and support to keep your equipment running. Our technical support services range from manuals and diagrams, to phone consultation, or on-site assistance. HUB will help you design an efficient and simple combustion system that meets your needs. Through our engineering associate, Control Point Technologies, Inc., HUB can also provide complete engineering and permitting services to satisfy local and state compliance issues; these services include stamped engineer drawings, permit applications and meetings with regulatory authorities when necessary. or an entirely new combustion system you will get it faster from HUB and we will ensure that it works for you for years to come. 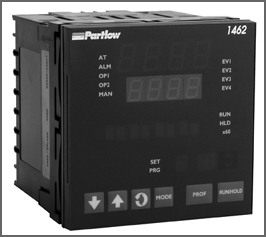 This page contains a representative selection, with approximate pricing, of commonly used control system components. We carry far more parts than are listed. Please call us if you don’t see what you’re looking for. Listed below are our most popular models. Does not require 110 for operation. Many types of thermocouples are available. These are a few of the sizes we commonly use. Thermocouple prices fluctuate depending on the cost of platinum wire. Call for current prices. Other length thermocouples are available. 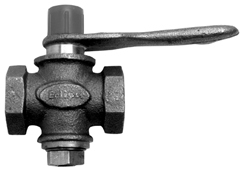 1" Metering Orifice Valve—$ 121.00. Many types of gauges are available. Please call to discuss your particular needs. Many other sizes are available. Call for a quote. 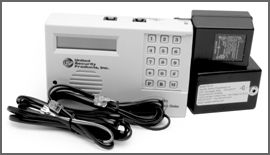 If your furnace goes out this system activates and calls up to 4 numbers, 3 times each & can dial pagers. HUB encourages all of our customers to use proper flame safety devices. Since most installations are unique, HUB quotes combustion systems on an individual basis. Please contact us to help configure a new system or to upgrade your existing set up. We can supply you with everything you need. Years of installation experience will get you up and running and help keep you that way! Tetraglass 3000° Tadpole Tape—$ 10.50/ft.